Deepika Mittra is a strong advocate for wellbeing and her goal is to empower individuals on their personal journeys of health and vitality. 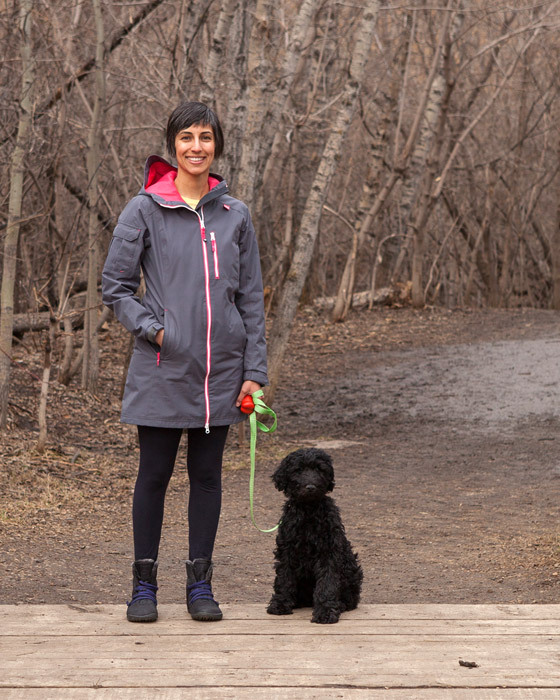 Deepika and Nibby enjoying the Mill Creek ravine. As you work with Deepika, you will benefit from her multifaceted approach, including being welcomed by Nibby, her four-footed companion. When you enter Deepika's office, you will notice a variety of seating options, offered as a means to help you to tune in to your body and what feels most comfortable. In addition, Deepika also offers walking sessions as appropriate. Deepika is living her life by design: working to create a significant amount of room for her family, friends, community and herself. She is a believer of the slow movement and likes to take space to marvel in ordinary moments of interaction and simply being instead of doing. When not at the office, Deepika enjoys being outside, taking in an art class or visiting seniors when volunteering with her son at a care centre. A fan of travel, Deepika has done quite a bit of globe trotting. Along the way, she has completed her scuba diving certification, yoga teacher training, spent time volunteering in the slums of Mumbai and performed in dance festivals. One day, she’d love to make it to the Galapagos to see giant turtles, climb Machu Picchu and walk the Camino in Spain. Until then, she’s happy kicking around her backyard and using sidewalk chalk to make the world more beautiful!